Philips 8804 hands on review | What Hi-Fi? Philips and Bowers & Wilkins are extending their partnership in 2019, with a flagship LCD model featuring B&W speakers following fairly hot on the heels of last year’s flagship OLED. In fact, the new 8804 has exactly the same speaker system as the OLED903 (although it’s been mounted slightly differently) and B&W says the two models sound the same. Is that the case? And how’s the picture performance? We went hands-on to find out. First things first, this is a very handsome set. It’s obviously much thicker than an OLED such as the OLED903, but the B&W soundbar at the bottom looks less bolted-on and more part of the overall design. Perhaps that’s because the B&W sound system was part of the plan from the start with this model, and that there’ll be no version without it. The speaker section itself has a lovely, textured, fabric cover, and below are two transparent feet, one of which has the Philips logo on the top, while the other is Bowers & Wilkins-branded. There’s actually no forward-facing badge, making the 8804 a TV of rare, quite classy modesty. As with the OLED903, the 8804’s B&W soundbar is partnered by a woofer mounted to the rear of the set. But while the woofer itself is the same as before, it’s now decoupled from the chassis and mounted much lower down in order to avoid agitating the LCD panel - something that’s not a concern with an OLED. 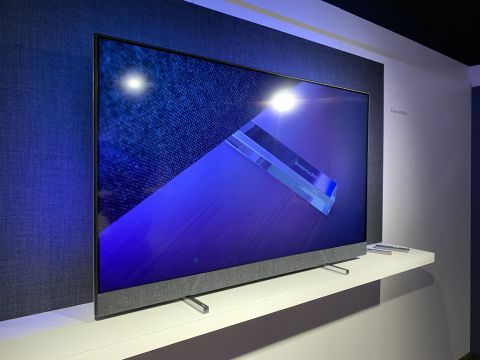 The TV will be available in three sizes - 50in (50PUS8804), 55in (55PUS8804) and 65in (65PUS8804) - and each model gets three-sided Ambilight, 4K resolution and a direct LED backlight. Philips isn’t (at least at this point) revealing specifics such as the number of dimming zones or a peak brightness figure. We do know, though, that the 8804 unfortunately doesn't get the new, third-generation version of Philips' P5 chip that's in the new OLED804 and OLED854, instead relying on the first-generation P5 from the older 55POS9002 OLED. Whether this will in any way hold it back is something we won't really know until a sample comes in for full review. The operating system is once again provided by Google, with the 8804 running Android 9.0 at launch. There’s been no mention of Philips bolstering Android TV’s default app selection, which leads us to expect it’s got no plans to do so, which would be a shame considering the company’s 2018 sets lacked ITV Hub, All 4 and Demand 5 and had some issues displaying HDR from some apps that should have it. Speaking of HDR, the 8804 matches the vast majority of its 2019 Philips stablemates by supporting HDR10, HLG, HDR10+ and Dolby Vision. That’s every format of any current value on board, which is very much what we like to see. Given the time and expertise lavished on the 8804’s sound system, it’s little surprise that its audio performance was the subject of most of our demo time, but we did get to briefly appraise its picture quality and came away impressed. For a backlit set, blacks looked deep and convincing, with bright whites and vibrant colours punching through satisfyingly. This doesn’t look like a Samsung Q9FN-rivalling performance in terms of contrast, but then we don’t expect the 8804 to be priced as high as Samsung’s flagship 4K set and in its own right the 8804 looked dynamic and enticing. Detail levels looked high, edges crisply, sharply defined, and the overall image was solid and deep. There looks to be very little to be concerned about in terms of the picture performance, but the demo really was brief and restricted to 4K content, so we’ll obviously reserve final judgement for when we get a sample in for a full review. We’d need to put the 8804 next to the OLED903 to be sure, but upon first listen the former does sound very similar to the latter - detailed, weighty but tonally balanced, dynamic and direct. There’s an openness and rhythm to the performance that’s rare for a TV and more in line with what you’d expect from a decent soundbar. Philips has worked hard to ensure that, despite the lower placement of the woofer, the audio sounds as if it’s coming from the centre of the screen, and that work appears to have paid off - voices and effects are strongly linked to the onscreen action, as they should be, but not constrained to the screen itself. A new edition when compared to the OLED903 is Dolby Atmos support, and we’re as unconvinced by this on the 8804 as we have been by every other TV-based implementation of the tech, bar the genuine upward-firing speakers of the new Panasonic GZ2000. Here, the speaker system has not changed to make the most of the Atmos compatibility, which means the TV is relying entirely on software to produce its object-based audio, and it shows. While flicking the Atmos mode on produces a more open and spacious sound that does allow for some locational identification of effects, directness and projection are compromised, with the sound being tall but restricted to the wall behind and around the telly. To reiterate, this is essentially what we’ve come to expect from TVs with Atmos support so is no black mark against the Philips. We’re simply pointing out that, on this early evidence, the Atmos badge on the 8804 doesn't seem worth getting excited about as the TV sounds best with the mode switched off. That said, we’ll do much more experimenting once the TV comes in for review, and perhaps we’ll be pleasantly surprised by the feature. As ever, there’s only so much we can discern from a hands-on session on account of brevity and lack of control, but the Philips 8804 looks as though it will be a strong contender for those looking for a TV that costs less than a flagship but boasts superior sound. The picture appears to be punchy and natural, while the sound is a step above what the vast majority of rivals offer. Of course, much will depend on the price, which hasn’t yet been announced, as well as what Philips’ rivals come up with over the course of the year. Needless to say, we’re very much looking forward to getting the 8804 in for a full review.